I`m Milena Pafundi 33 years old and I define myself as a Feminist Visual Artivist Bisexual cis-women. I studied a film carrier but my life and artistic work turn into self-taught since 2001 when I started experimenting with my videohome-camera, my Analog Tv and some visual software, always interested in hybrid technics experimentation. In 2007 my video “Un tiempo” won ALUCINE, film festival in Toronto, Canada. A 25 minutes one take video of Myself recorded with video home-camera. I also define myself as VJ and I have been performing until now in different Festivals: Punto y Raya, Panoramic, Espacio Fundación Telefónica, Satellite, Mutek, Creamfields, Cocoliche, Onedotzero, Crobar, Fuga Jurassic, technopolis, CC Matienzo, Cultural Center San Martin, Art City Santa Fe, Moving image Biennale, Teatro Colon, etc. In November/December 2015 I took a residence in MACBA, where I exhibited the installation “Región del Plano” and in February 2016 I live visual performed in MACBA intervening an installation of Andrés Denegri, which proposed a live manipulation of super8 film. In june 2016 I exposed “Tóxica, la masculinidad” (in CC Matienzo) a video-text-installation that questions the hegemonic masculinity as the main source of gender violence. The installation invite visitants to get into a paper cave that I built and found inside a little black-box with a button. After pressing it, this black-box print randoms gender-statistics, misogynist and transphobic messages from internet. In 2013 I founded the Collective Articiclo: Is a Tricycle mobile projection with wich allows to use public space as a place of projections. With Articiclo we work together with different NGOs. We participate in massive public mobilization on LGBTQI rights, human rights, a healthy environment and cultural diversity. 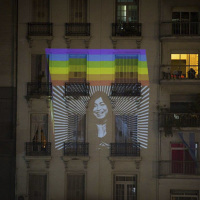 The Video and Photo record of the projections from cell phones and cameras that citizenship made, establishes a form of diffusion of these color-ful, magical and with a strong and clear message as could be, for expample the “Abortion: more information less risk” , and the feminist leitmotiv “No aggression without response”, etc. With Articiclo we participated in the NiUnaMenos mobilization 2015/16, we opened the festival Art City Santa Fe, we held an street action in support of the 43 missing Ayotzinapa, participated in the Festival Migrante Film, in the Pride Parade 2015 and in September 2016 we carried out a Public Cycling against Gender Violence and supporting gender. Also during the last 7 years, in combinations with my artistic life I worked 5 year as pos-producer in TELAM, “National Public News Agency” and since 2 years ago I’m in charge of the Audiovisuals and Digital Contents within the press office at the “Public Defense Department, Ciudad de Buenos Aires”, working mainly on human right issues.